We realize that adult learning is a long process that requires special effort, so our training programs and courses focus on the development of each individual at each learning stage. All of our instructors are experienced language specialists and educators who always keep up with the most recent research and methodologies in teaching. Most of the instructors for our foreign language courses are UI graduates and hold graduate degrees from various reputable universities in the UK, USA and Australia. They have all been selected on the basis of their teaching experience and their command of the English language. The length, substance and methodology of every course and training program we offer are specially designed, and based on the needs-analysis we carry out prior to the commencement of each course. We realize that second language learning for adults is something that requires great effort. As well, we are aware of the importance of appropriate language learning methodology for adults. Therefore, in our language classes, we encourage the use of the communicative approach for teaching English as a foreign language to develop learners’ competence in English. By teaching the language in meaningful situations with emphasis on communicative functions, we ensure maximum student-talk time. 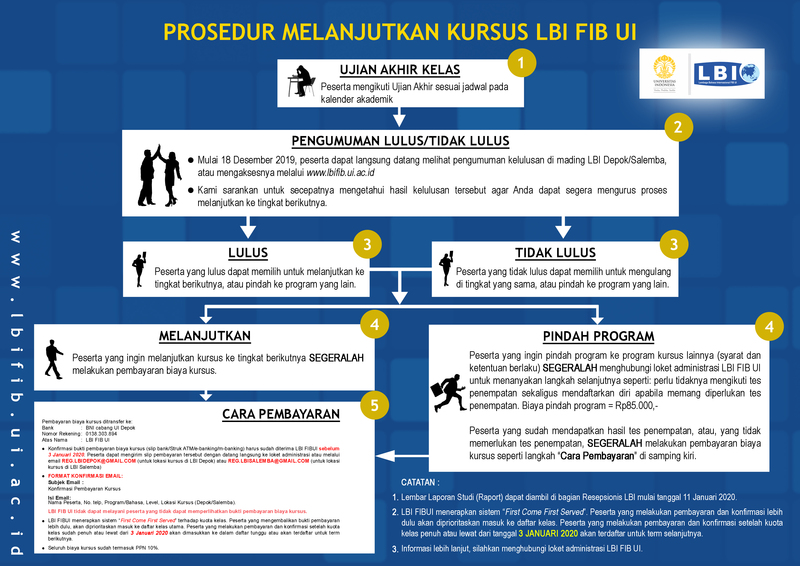 Lembaga Bahasa Internasional FIB UI is an academic venture unit within the Faculty of Humanities, University of Indonesia. Its establishment is mainly intended for providing integrated language services to you, our prominent clients. 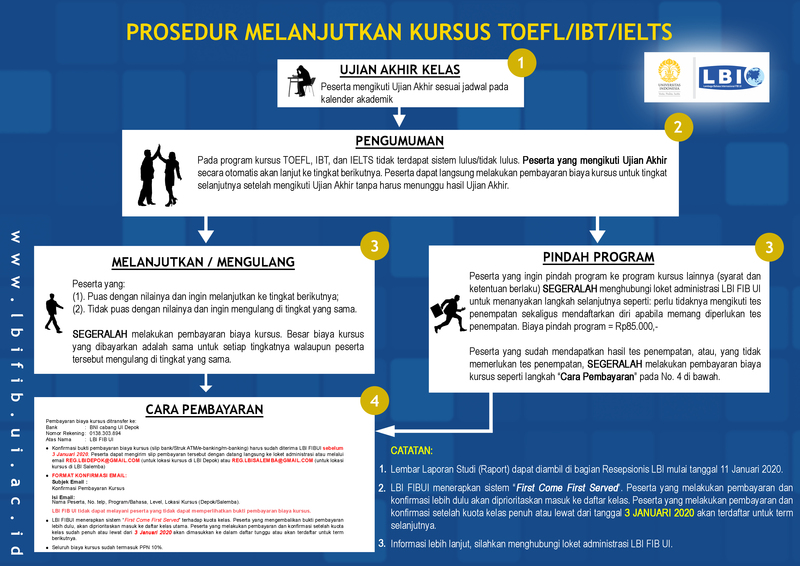 The language services you can get are Bahasa Indonesia untuk Penutur Asing (BIPA/Indonesian Language Program), Program Pelayanan Bahasa (PPB/Foreign Language Program), and Program Pengembangan Penerjemahan (PPP/Translation and Interpretation Program). We can ensure your highest satisfaction with our services through our staff’s highest commitment to providing the best quality education and training in Indonesia. Jl. Salemba Raya No. 4, Jakarta 10430.